Different tools make fishing such a fun activity. Seasoned anglers will tell you that the quality of tools you take fishing can either make it a frustrating process or an enjoyable one. One such device is the fish fillet knife. Saltwater has a corrosive effect on metals, so it is essential that you look for a knife whose blade is resistant to corrosion as well as having a handle that is moisture resistant. If you are thinking of getting a saltwater fish fillet knife for your next trip, we hope this article will provide ample information in helping you make the right choice. It is essential to determine the blade size that best suits your needs. Fillet knives with big blades are best used for big fishes while fillet knives with small blades are best used for small fishes. Trying to use a fillet knife with a big blade to prepare small fishes could lead to a messy job, as well as making the task more difficult. Likewise, using a fillet knife with a small blade to prepare big fishes could overcomplicate the task. Fillet knives with narrow blades are generally more flexible than those with thicker blades. Preparing a small fish requires a lot more precision than preparing a big fish. It is therefore reasonable that a fillet knife with a more flexible blade would do a better job filleting small fishes than that with a rigid blade. One major issue that tools with metallic surfaces face is corrosion. A corroded fillet knife is useless and will break easily. Therefore, to ensure that you get a tool that will last you a long time, the material the blade is made from is something that requires your attention. Stainless-steel materials are generally resistant to corrosion. So, it is advised that you go for a knife that has a stainless-steel blade. The handle of your fillet knife is one of its most important features. Without the handle, you basically cannot use the knife. It is important that you get a knife with a very comfortable and safe grip. The handle of your fillet knife could also determine the level of risk you are exposed to. Also, the material the handle is made from could also determine how long your tool will last. For example, wooden handles are more susceptible to catching fire than rubber handles. Nowadays, you will mostly find fillet knives with rubber or plastic handles. These handles have better grips and are safer to use than the wooden ones. Although most fillet knives are quite cheap considering the value they offer, there are some that are even cheaper. Everyone wants to get value for money spent, so, it is crucial that you investigate what the fillet knife is offering you and at what cost. Most times, this is the difference between getting an average deal and getting a great one. Sharp blades generally make filleting easier. Using your fillet knife continuously over a period will inevitably reduce its sharpness. When you find out that filleting has become more difficult than it used to be with the same blade, then, your knife is losing its sharpness. It is important that your fillet knife remain as sharp as possible for as long as possible. Some blades have the property of retaining their sharpness for a more extended period than others. This quality makes them better choices. Also, some fillet knives come with sharpeners. This feature has drawn many potential buyers to the brands that have this property. 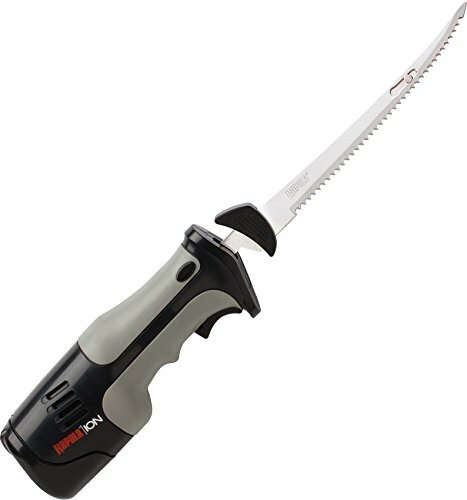 Electric and manual fillet knives have many differences. Electric fillet knives are faster and weigh more than manual fillet knives. You should also expect that the electric knives will be more expensive. An electric fillet knife can make the task of filleting the fish easier. If you go with an electrically powered knife, you have a choice between an AC power or lithium ION battery. Safety is one of the most important things to consider when buying a fillet knife. A fillet knife with a good grip offers you more protection than one with a bad grip. Some fillet knives also come with a raised guard on the handle. This function protects you when using these knives. Another thing that the safest fillet knives have is a protective sheath. The blades are placed inside this sheath when they are not in use, protecting you from any injury as well as improving the durability of the knife. Morakniv fishing comfort saltwater fillet knife is a high-grade fillet knife that has been made in such a way as to make filleting a pleasant experience. It has a stainless-steel blade that is 6.1-inch long. The stainless-steel blade means it is corrosion resistant, so, you can expect to use the knife for as long as you want. It can be used to prepare most sizes of fish, though, it does a pretty good job when applied to fillet smaller fishes. The high-friction handle gives you a solid grip and makes handling it comfortable even with slippery hands. It is evident that much thought went into making this knife a very comfortable piece. The 12C27 stainless steel used for this knife is generally known for its quality and sharpness. So, you do not have to worry about the sharpness of your blade. Also, its handle will not absorb odor when you are using it. Pretty hygienic right? 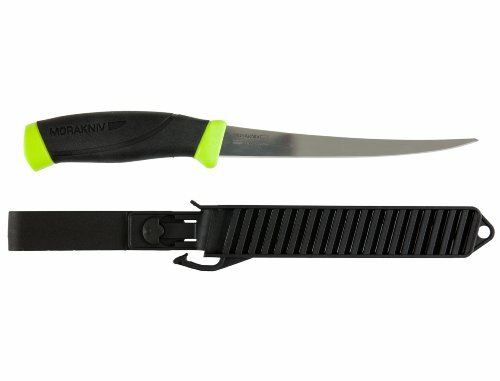 One thing that makes the Morakniv fillet knife popular among users is the rugged sheath that comes with it. This allows you to store the knife safely and securely. It also has a belt clip though some users have complained that the belt clip comes off too easily. If you are not one for long sized blades, then this knife is an excellent choice for you. Apart from all its great features, it also comes at a very affordable price. 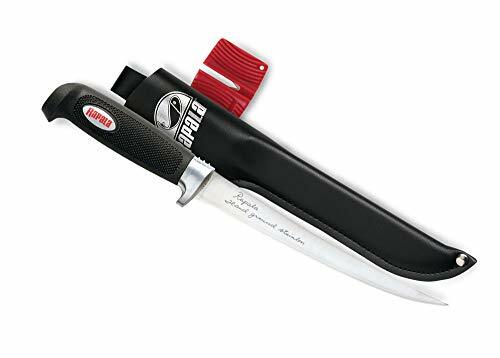 The American Angler Delta fillet knife is a razor-sharp fillet knife that makes filleting a breeze. It has a stainless-steel blade that is about 9 inches long which is pretty long when compared to its peers. This length of the blade means it does a good job filleting bigger fishes. The handle is well-made and gives you a firm and comfortable grip which makes handling of this knife pretty easy. It is also a pretty affordable knife which is also one of its upsides. One downside to this blade is the fact that it does not come with a protective shield. This removes a little from its safety points. If you can look beyond this, it is a very sharp and durable knife that you can be sure will not fail you when it is time to cut those fishes. The Rapala4 fillet knife is a top-quality knife from Rapala. It offers you high-quality functionality at a reasonable price. Its flexible blade is made from stainless steel which improves the durability. It is also a pretty sharp fillet knife, so you do not have to worry about how easy it makes your job. The soft grip, no-slip handle is moulded to give you maximum comfort when filleting your fish. Though, the handle is short which makes using it a bit difficult. Its short blade means it can be used to fillet any fish, though, it is more suitable for smaller fishes. One of the major selling points of this knife is the fact that it comes with a protective sheath. This means you do not have to worry about how safe the knife is. Apart from the sheath, it also comes with a sharpener. So, whenever it loses its sharpness due to prolonged use, you can use the sharpener. This extends the lifespan of this knife as you can keep using it and sharpening it for as long as you want. The Rapala heavy-duty electric fillet knife is another brilliant product from Rapala. It has a 71⁄2-inch reciprocating blade which can be used for any filleting work. At first sight, this knife gives you the impression that it is going to last very long, because of the quality of materials used. It is driven by a very powerful motor that gives it more blade speed and power than most other fillet knives. The power cord is 8 feet long. So, you do not have to worry about it getting in the way of your work. Also, it works with 110 volts power. The plastic handle has a very comfortable grip. The vibration is reduced, and it does not heat up quickly like some other electric fillet knives. It suffices to say that it is a very comfortable knife to use. One drawback to owning this saltwater fillet knife is that it does not come with a sheath or case. If you do not mind this, then, this is a great fillet knife for you. Do electric cords make you uncomfortable? Well, you are in luck because the Rapala lithium ion fillet knife is a cordless one. It uses a lithium-ion battery that takes less than two hours to charge (according to the manufacturer). It has a very sharp 7-inch stainless steel blade that is made to last as long as possible. At full charge, you can use the knife for about eighty minutes before it needs recharging. It comes with a 110-volt charger. 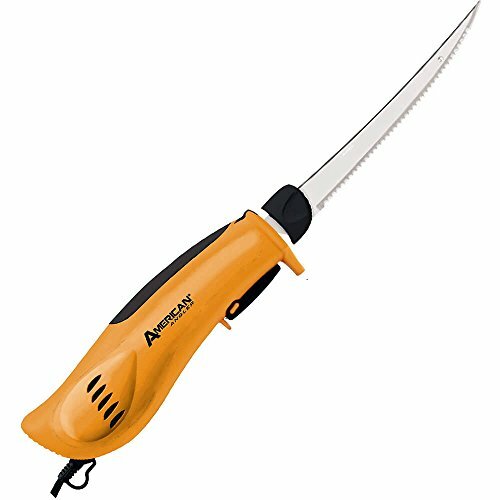 The American angler PRO electric fillet knife is one of the most effective and most robust fillet knives around. With this knife, you can prepare your large fishes with little effort. It has a replaceable stainless steel blade. The curved blade is 8 inches long. One of the major selling points of the American angler PRO fillet knife is the fact that it lasts very long. In fact, among its peers, it is one of the longest lasting knives. The blade also runs faster than most other electric fillet knives, so, your filleting work will go smoothly. It is powered by 110 volts power supply, and the cord is about 8 feet long making its use very comfortable. One other upside to this fillet knife is the fact that the blade can be replaced. Many a time when the edge on most fillet knives become dull, you have to discard the whole knife. Well, not anymore as you can get a replacement blade for this knife. It has a handle designed to have a firm and comfortable grip. Let us just say this fillet knife is one of the best out there. 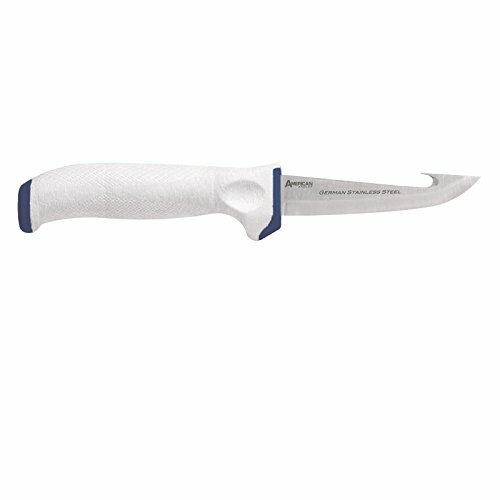 If you are serious about going fishing, then, having a fillet knife is non-negotiable for you. They help you process your catch quickly and effortlessly. The quality of fillet knife you use will determine the quality of filleting you do. The fillet knives discussed here have been chosen after considering their qualities. You should note that its price does not determine the quality of a product. You need to investigate the quality of the product before investing in it. Depending on your preference, you might consider one of one of our selections to take along on your next fishing excursion.